Time for our top 10 stories from 2015. Consider this our gift to you. Happy reading! - Loggerhead sea turtles nesting in Georgia set another record. - Study shows Flint’s gator snappers slow to rebound from commercial trapping. - Rare golden eagle caught in Georgia to track through migration. - Three things to know as the Georgia Plant Conservation Alliance turns 20. - Tag! 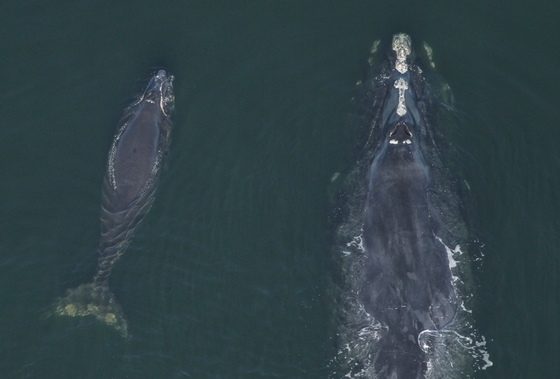 Right whales were it in first satellite tracking project. - Found at Tallulah Gorge, Georgia’s first ‘wild’ peregrine falcon nest since 1930s. 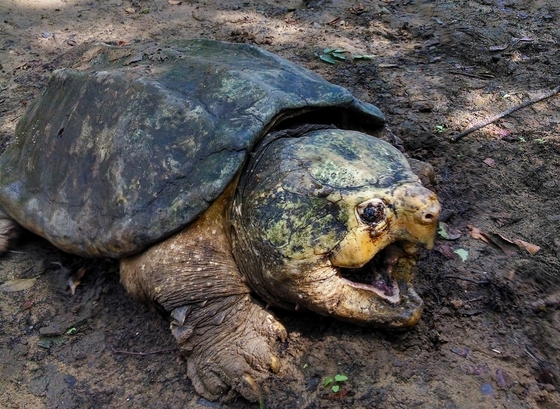 - Largest head-start release helps gopher tortoises at Yuchi WMA. - Fall surveys find new sites in state for Georgia aster. - GPS-based project maps manatee movements along coast. - Fungal disease documented in more snakes in state. - Hellbenders show swimming and hunting moves on video. Here’s hoping last week’s sighting of Harmony and her new calf bodes well for North Atlantic right whales this winter. A Florida Fish and Wildlife Conservation Commission survey flight spotted the well-known adult whale 10 miles east of Jekyll Island Dec. 10. Nicknamed Harmony, the 15-year-old mom was nursing a calf, her third known offspring and the first of the 2015-2016 right whale calving season. The survey crew saw another mother-and-calf later that day near St. Augustine, Fla. A sickly 10-year-old female nicknamed Cherokee, who has never calved, was spotted on Dec. 12 by Sea to Shore Alliance, which conducts survey flights for DNR. North Atlantic right whales are one of the world’s most endangered marine mammals. And coastal Georgia and northeast Florida are their only known calving grounds. Each winter, pregnant and some non-calving right whales migrate here from the northeastern U.S. and Canada. Yet sightings have slipped, according to Clay George, Georgia DNR’s lead marine mammal biologist. “In the past five years, we’ve seen 15 calves per year, compared to 24 per year on average in the 2000s,” George said. Also, fewer non-calving whales are showing up – 14 last winter compared to almost 200 in 2010. Changes are being seen, as well, at the whales’ summer feeding grounds. For example, the number of whales visiting the Bay of Fundy – a popular late-summer foraging site in southeast Canada – has plummeted in recent years. At the same time, right whales have been seen in “new” habitats, like the Gulf of St. Lawrence, George said. Scientists are unsure if the recent changes are a temporary anomaly or whether they foretell major changes to right whale habitat and distribution. Including data from monitoring in the Northeast and Canada, the North Atlantic right whale population is growing an estimated 2.6 percent a year. 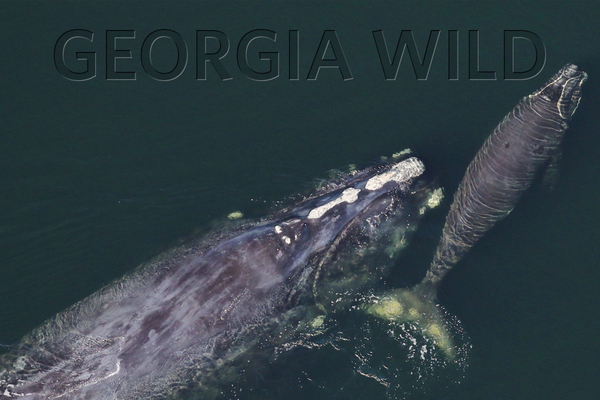 And for this charismatic species – Georgia’s state marine mammal – hope springs eternal. Even in fall and winter. - DNR works with the National Marine Fisheries Service, Florida Fish and Wildlife Conservation Commission, Sea to Shore Alliance and others to conserve right whales. We monitor the population, protect habitat and raise awareness to reduce shipping strikes and other threats. - Aerial surveys flown December-March document calf production, collect photo data and alert ships to whale locations. By boat, DNR collects photo ID data and genetics samples and responds to whales entangled in fishing gear, a leading threat. - DNR’s Nongame Conservation Section also is in the second season of a three-year project to develop and use minimally invasive satellite tags to track right whale migrations. Of three whales tagged in January, one was followed more than 1,000 miles from Florida to Massachusetts. Up to seven whales will be tagged this season. - When boating or fishing by boat on the coast mid-November through March, keep an eye out for right whales. If you spot one, stay at least 500 yards away, as required by federal law to reduce risks of harassing or hitting a whale. Disturbing these animals, particularly during the vulnerable calving season, can affect behaviors critical to their health and survival. - Buy or renew a DNR eagle or hummingbird license plate. 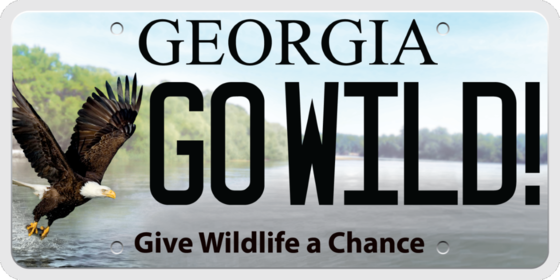 These plates, only $25 more than a standard Georgia plate, support the Nongame Conservation Section, which depends largely on fundraisers. - Contribute to the Georgia Wildlife Nongame Conservation Fund state income tax checkoff when filing your 2015 taxes. The Give Wildlife a Chance checkoff is another key nongame fundraiser. - Follow DNR's right whale work through Facebook, Flickr and this newsletter. - Consider buying ocean-friendly seafood. Tips. 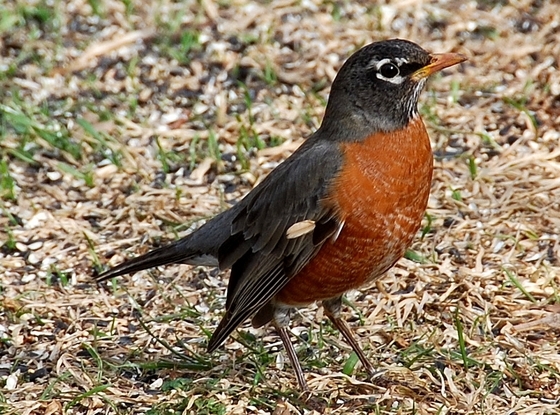 American robins are inexorably linked to spring. Many Americans believe that after a long, bleak winter, a robin in their backyard is a sure sign that winter is weakening and spring is just around the corner. But I’ve never considered robins a harbinger of spring. To the contrary, I associate them with winter. I guess the reason why is that although I see them throughout the year, I see more in winter than during all other seasons combined. Read the rest of Terry’s column for more on mega-sized robin flocks, plus how to make your yard more friendly in winter and year-round for these “early” birds. Need a wild last-minute gift? With ideas that vary from buying an eagle or hummingbird license plate to purchasing a “Calls of the Wild” frogs CD, here’s a list that will help conserve Georgia wildlife. And don’t forget: Some sale proceeds from the landmark UGA Press books “Amphibians and Reptiles of Georgia,” “The Breeding Bird Atlas of Georgia” and “The Natural Communities of Georgia” also go to the Georgia Nongame Wildlife Conservation Fund, created to conserve native wildlife and wild places! The first coastal ecosystem report card for Georgia gives the state a B+ for 12 indicators of human health, fisheries and wildlife. Based on DNR surveys and inventories in 2014, the report card presents a timely and geographically detailed assessment of ecosystems in a public-friendly way. Weekend for Wildlife, Nongame Conservation’s primary fundraising event, will return to Sea Island Jan. 29-30. Learn more and register for the 28th annual event at www.weekendforwildlife.com. A Savannah symposium will dig deep into how the Georgia coast’s environment and natural resources shaped human history in the region. Coastal Nature, Coastal Culture: Environmental Histories of the Georgia Coast, set for Feb. 18-20, features trips and leading scholars. Red-cockaded woodpecker prospects are brighter because of the Safe Harbor Program, which turned 20 this year. 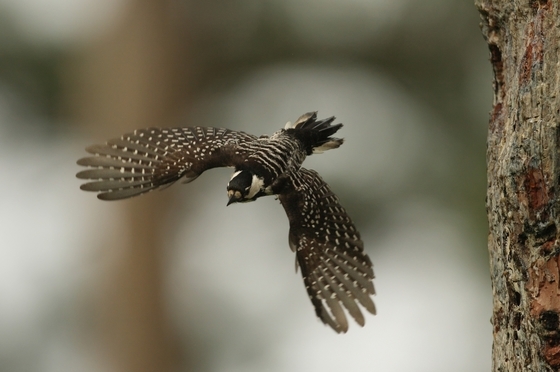 The program in which private landowners voluntarily manage their forests to benefit this endangered species includes almost 2.5 million acres and 835 red-cockaded woodpecker groups across eight states, including nearly 177,000 acres and more than 100 groups in Georgia. Legislation making the federal tax incentive for conservation easements permanent has passed the U.S. House and Senate in what the Land Trust Alliance calls "a huge win for conservation, landowners and the land trust community." The bill also reauthorizes the Land and Water Conservation Fund and raised funding from $306 million last year to $450 million, according to the alliance. DNR biologists and others recently collected specimens of the undescribed Altamaha and Bartram’s bass and the recently described Chattahoochee bass for fish illustrator Joe Tomelleri. Tomelleri's illustrations will be used to help identify these bass – all high-priority species in the revised State Wildlife Action Plan – and promote Georgia as a hotspot for unique sport fishes. Young whooping cranes led on their first migration by ultralight aircraft are slowly making their way south. Delayed by warm southerly winds, as of Monday the 2015 Operation Migration group of endangered birds and dedicated humans was in north Alabama, with plans to fly south through Alabama, then across southwest Georgia en route to St. Marks National Wildlife Refuge after the Christmas break. Artists in grades K-5 are invited to take part in the 26th annual Give Wildlife a Chance Poster Contest. The competition held by the Nongame Conservation Section and State Botanical Garden of Georgia is aimed at increasing knowledge and appreciation of the state’s nongame wildlife and habitats. Deadlines and details. Beach rosemary, also called sandhill rosemary, was surveyed on part of Ohoopee Dunes Wildlife Management Area near Swainsboro last month by Nongame Conservation and UGA scientists. 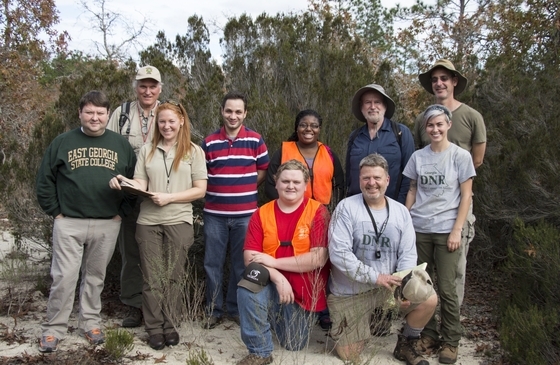 Also helped by East Georgia State College students and professors, the group counted about 1,100 adults, 1,650 juveniles and more than 400 seedlings of the rare shrub, a marquee sandhills species. Photos. DNR botanists Tom Patrick and Dr. Mincy Moffett helped with a long-range lesson on cotton, providing teacher Missy Biddinger of St. Joseph Consolidated School in Hamilton, Ohio, details on cotton biology and ecology, and even plants, for early American history lessons on natural resources and trade. “The kids loved it!” Biddinger wrote, noting that fellow teachers also used the plants with their students. Some 665 female loggerhead sea turtles were detected nesting on Georgia beaches this summer, according to the latest report from research done for DNR by UGA’s Warnell School of Forestry and Natural Resources Nairn Genetics Lab. The analysis of DNA in eggs showed that about 225 females were new to the database, representing first-year recruits in the population. Why did the kingsnake vibrate its tail? To advertise the tip as the place for a predator to attack, allowing the snake to escape with its vitals intact, says senior wildlife biologist John Jensen, who videoed this tail-shaking kingsnake while moving it off a road in Piedmont National Wildlife Refuge. The New Georgia Encyclopedia is part of the National Endowment for the Humanities’ top 50 projects that “have enriched and shaped American lives,” according to the federal agency celebrating its 50th anniversary. Many DNR biologists contributed to what is touted as the first state encyclopedia designed exclusively for online use. Names in the news: Dr. Bob Sargent is the new program manager at the DNR Nongame Conservation Section's Forsyth office. Sargent formerly worked as Robins Air Force Base natural and cultural resources manager, and served eight years as Georgia Ornithological Society president. Dr. Jessica McGuire has been named Private Lands Program manager with DNR Wildlife Resources Division’s Game Management Section. Most recently Nongame Conservation Section’s red-cockaded woodpecker and Safe Harbor Program biologist, McGuire also has been a Private Lands Program biologist. Tamatha Beckham is now program manager at DNR’s Go Fish Education Center. Beckham has coordinated administrative operations at the Perry center since it opened in 2010. 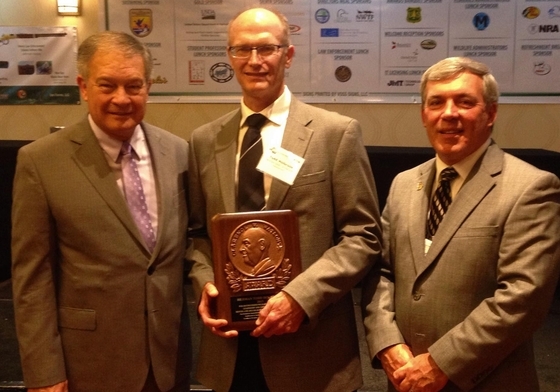 Former DNR Deputy Commissioner Todd Holbrook (photo below) of Conyers has earned the 2015 Clarence W. Watson Award, considered the Southeastern Association of Fish and Wildlife Agencies’ most prestigious honor. Holbrook’s late father, Duff Holbrook, received the award in 1988. Former U.S. Fish and Wildlife Service biologist Jimmy Rickard will be the U.S. Forest Service forest botanist-ecologist on the Chattahoochee-Oconee National Forest. Gov. Nathan Deal has honored DNR Law Enforcement’s Capt. Chris Hodge, Cpl. Craig Smith and Ranger 1st Class David Brady with Public Safety Awards for Acts of Heroism. On Dec. 5, 2014, Hodge, then a sergeant, pulled a Camden County Sheriff’s deputy from a burning patrol car. The night of March 9, Smith and Brady rescued a man entangled in branches and submerged to his neck in the rain-swollen Satilla River. Authors of the paper “Significant new records of amphibians and reptiles from Georgia, U.S.A.,” published in Herpetological Review, included DNR's John Jensen and Robert Horan. Jan. 6-7 – Bog Learning Network annual meeting, University of North Carolina Asheville, N.C.
Jan. 16 – Artin’ on Nature, free art program, Charlie Elliott Wildlife Center, Mansfield. Registration required at (770) 784-3059. Jan. 21 – Workshop for partners in the monkeyface/white fringeless orchid restoration project funded via the National Fish and Wildlife Foundation Five Star and Urban Waters Grant Program, Big Canoe, Jasper. Details. Jan. 23 – Bears of Georgia, free program on Georgia’s black bears, Charlie Elliott Wildlife Center, Mansfield. Registration required at (770) 784-3059. - Saving a sea turtle? No sweat. - Why opossums are amazing. "Big penalty awaits flytrap pilferers," The News & Observer, Raleigh, N.C.
(video) "Cougar spotted on camera in Humphreys County (Tenn.)," WBRC-TV (Channel 6), Birmingham, Ala. This 39-inch-long lake sturgeon and a smaller one were dip-netted by DNR fisheries biologist John Damer below Mayo Lock and Dam and released in the Coosa River above the decommissioned dam Dec. 3. Spotted by anglers, the sturgeon – indicators of efforts to restore the threatened species in the Coosa basin – likely entered the lock seeking refuge from strong currents after heavy rains, according to Damer. 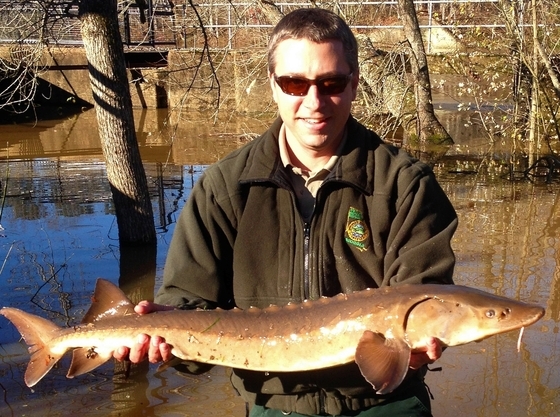 What to do if you see or catch a lake sturgeon.